Aroma Kitchen is all about using essential oils in cooking. I use essential oils all the time for cleaning and DIY beauty products, but I have never tried cooking with them. 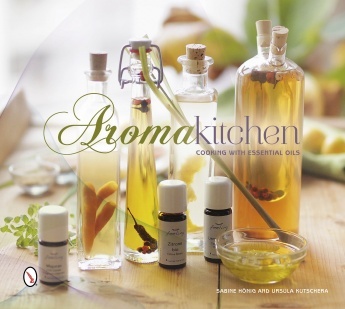 Aroma Kitchen: Cooking with Essential Oils opens with information about essential oils. Where they’re found and how they’re produced. How to determine quality essential oils and uses for essential oils outside of the kitchen. Next the book covers cooking with essential oils. There are recommendations of quality and how to use them in cooking. You use a very small amount of oil with an emulsifier when cooking. It includes a very helpful list of oils and any precautions that they might have. Preparing the essential oils is next. There are a series of recipes and techniques for preparing the oils ahead of time. It is suggested that you start with these to ease your way in. Some that I marked to try are: Provencal seasoning salt, Sicilian seasoning oil, blood orange lemongrass salt, lavender salt and orange-bergamot vanilla honey! Following that section is the recipe section. It is divided into Cold Appetizers, Warm Appetizers and Soups, Main Dishes, Side Dishes, Desserts and Drinks. Also included is a set of menus – including everything from holidays and special occasions to vegan and vegetarian. None of the recipes are particularly difficult and I’ve marked several to try. I loved this book and plan on making a lot of the condiment type recipes. Seasoning salts and flavored oils are a quick way to add a little zing to a recipe. This is a nice book to add to a cookbook collection or to get if you are interested in adding essential oils to your cooking. **I received a copy of this book for review. Opinions are my own. Amazon links are affiliate links. I’ve never heard of putting essential oils in food before- this is a totally new concept for me! Thanks for the review! This sounds lovely. I’d really like to place with essential oils in baking but would definitely need a guide to make sure it is all safe. Lavender oil and choc chip cookies would be divine. Love essential oils and always looking for new ways to incorporate them into my cooking. This book is a must.